Survey Of Nearly 66,000 People Reveals Surprising Differences In Attitudes Toward Vaccine Safety : Goats and Soda A survey of nearly 66,000 people worldwide reveals where parents have the most — and least — confidence in vaccines. 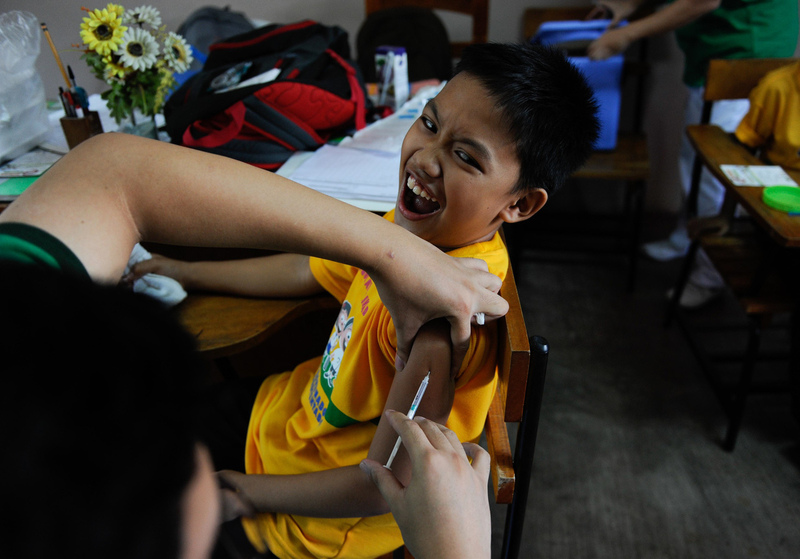 A boy in the Philippines is vaccinated for dengue fever on April 4. In a new survey, only 2 percent of people polled in the Philippines thought vaccines were unsafe. What leads some people to say no — rather than yes — to vaccines? A survey of nearly 66,000 people about attitudes toward immunization has found some surprising results. In France, 41 percent of those surveyed said they did not have confidence in the safety of vaccines. By contrast, in Bangladesh, fewer than one percent of those surveyed expressed a lack of confidence. Indeed, lapses and gaps in vaccination — including refusals by some parents to have their children vaccinated — have led to increasing numbers of outbreaks of polio, measles and other preventable diseases. Public health officials are worried about the possibility of the re-emergence of these illnesses — not just in the developing world but in highly developed economies as well. To find out more, we spoke to the lead author, Heidi Jane Larson, director of the Vaccine Confidence Project at the London School of Hygiene and Tropical Medicine. You surveyed people from 67 countries for your study. How widely do people's attitudes about vaccines differ? We asked people to [rank on a scale if they] agree or disagree with four statements: if they have confidence that vaccines are important for children; that they are safe; that they are effective; that they are compatible with their religious beliefs. Overall, people from around the world agreed that vaccines are important for children [the percentages who disagreed with this statement were under 10 percent in every region]. But when it came to safety, in France, 41 percent of the people disagreed. That is [more than] three times the global average of 12 percent. Seven of the least confident countries were in Europe and Eastern Europe. Why is Bangladesh more confident in vaccine safety than France? Bangladesh has had one of the most positive immunization programs in the world. They use a lot of community engagement, reaching all areas of the country. What was of key importance was working with trusting community members and others who were providing information and advice. Their campaigns have emphasized protecting children from disease; at one point the emblem was an umbrella covering everyone. Now it is a circle with a baby inside, even featured on postage stamps! And the public has seen a dramatic impact, with many fewer children suffering and dying of disease. In France, in recent years there have been a series of vaccine controversies that have eroded trust. There were suspicions about side effects from some of the vaccines, and there remained lingering concerns and anxiety even when the safety research showed no links. There was also an underlying distrust in the government [over how it handled these controversies]. Is there a lack of confidence in vaccine safety in developing countries, too? One of the things we are seeing in [a number of countries] is that both the least and the most educated people have questions about confidence in the safety of vaccines. In some elite circles in poor countries people will say, "Those vaccines are for poor children. We don't need to risk the potential side effects." It seems that such parents are more anxious about the risk of side effects than about the risk of a resurgence of the diseases immunizations would prevent. Is that true? They are not weighing the risk of getting the disease with the benefit of not getting it. They perceive that the risk of the disease is small and far away, not an imminent threat. The risk of the side effects seems nearer and raises anxiety. Will more education and information help dispel these anxieties? Education is not enough anymore. When people suspect a vaccine's safety, they go online and their anxiety may be reinforced by misinformation. I am not blaming this on the Internet alone, but I think it has contributed to it. Are some of the safety doubts related to religious beliefs? Religious beliefs are less a factor across countries. For instance, Muslims in a country where they [are part of the] majority may have more trust of government and in the safety of vaccines, which may be recommended or provided by the government, than Muslims in a country where they are a minority and are less trustful of government, with that lack of confidence spilling over to vaccines. Whatever your religion, the confidence level will differ across countries. Confidence in government seems to keep coming up as a factor. What role does that play? Putting your finger on confidence in immunization is like taking the pulse of trust in government. [Immunization] is the only health intervention that I can think of that is absolutely global, from the richest country to the poorest, and it is embedded in government decision-making. People might ask: What is the motive of the health provider is giving the vaccine? Do I trust them, are they interested in the health of my child and myself or are they trying to make money or is there another motive I don't know about? Are they making this decision for political reasons or for the good of the people and the public health? So distrust of government can amplify the lack of confidence in vaccine safety.